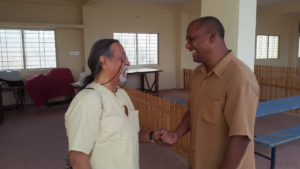 The other day I had the fortune of travelling with Acharya to Adhaar center, Chintamani and back to Bangalore. Being around him has allowed me to be part of many life situations and experiences. The realization from these experiences has enriched my life beyond my imagination. Though realization of truth is instantaneous, usage of these realizations in life is a continuous process of applying and learning. This journey was one such great learning opportunity. Just photos with captions might not have communicated all the realizations. So I felt the urge to share some of these feelings. Care and togetherness is the elixir of life! 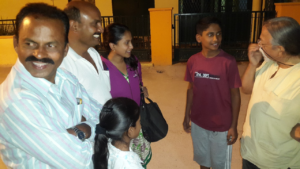 We met Amrutavalli amma and her mother. Ajji is bed ridden these days. She’s in her 90’s. She said that she misses the day to day work which she was actively part of. She dreams about how she is washing clothes, cleaning house, cooking food and taking care of others. Though she is bedridden she is very very aware. She was just so happy that Acharya and some of us had gone to visit her. Her eyes were lit up with the joy of seeing Acharya, especially when he held her hands, gently stroked her forehead and asked about her. 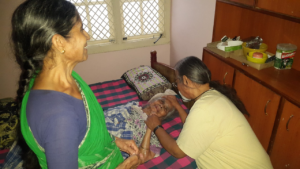 Even in her condition, she was more concerned about whether we were being offered coffee, how Madireddy’s mother was and such. It must be her care and concern for others that has kept her so well functioning. She is blessed to be cared for by Amrutavalli kind of a daughter. In our so called large cities and apartments we seem to be moving more and more into isolated prisons. What use is our material wealth when as young as 30 or 40 or 50 years old people are falling sick in so called hi-tech hospitals? Are we running around busily to pay for these hi-tech prisons? As we touched her feet and were leaving, her glowing eyes conveyed the whole story of small town simplicity, living together and caring for one another. Jai is a great friend I’ve come to know. His genuine care and concern for others is heartening. Through the stories regarding special children he shares in “Our Adhaar” group he has created a lot of awareness among all of us about how special Adhaar center is and how privileged we are to be with special children. I felt humbled at what an amazing contribution Jai is making by serving in Adhaar. We all have felt his love and veneration for Acharya. I got reminded that we are shaped by qualities of our role models. Greatness inspires greatness! It is always a treat to be with Acharya interacting with young children. I always find him enthusing them about aiming higher and aiming at life enhancing ways. Adhaar’s trustee Madireddy’s elder daughter is aiming to be a medical doctor. Acharya’s suggestion was to consider Ayurvedic studies rather than allopathic studies. To build a caring world, we need to consider our life choices very carefully, I felt. We had stopped for food on the way back to Bangalore. Acharya saw this group of enterprising people who had created a store-on-2-wheels. 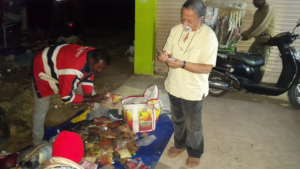 They buy cinnamon, dry grapes kind of items from Coimbatore and such places and travel in and around Chintamani, these days, to sell them. Their determination to make an independant living and create an ingenious solution was endearing. Acharya always talks about how commerce should be a win-win-win for buyer, seller and community at large. On all such occasions I’ve felt the deep concern by Acharya to create a society that lives to bring out the best in each other. He is constantly thinking and seeding ideas to create sustainable economic models. Many many such ideas always flow around him. I had been personally thinking how to help my father who has a patch of land where he wants to create a natural farm, but has been facing many challenges. There was a discussion about how even agriculture practices can be revived and made sustainable by making Ghati as a learning center with farmland owners coming together to meet and experiment in Ghati and implement their learning in their own farms. Later the produce can be combined with these kind of innovative distribution mechanisms and other large scale buyers (because of combined producing capacity.) Suddenly I felt the personal burden lessened. Solution is very simple: to learn together, work together and share together. I realized how spiritual knowledge and social welfare go hand in hand. All these incidents and many more happened in just a day of travel. Upon reflection, all seemed well connected to the theme of sevak…building a world of togetherness! As we continue to work together and as more and more join, it will be a living reality…sevak as a way of life. It felt beautiful.